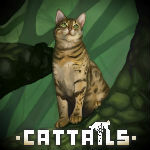 Ultra Rare item sightings | Cattails: Become a Cat! Okay, so I finally found a lunar butterfly in the swamp cliffs area and I want to know if the swampland is the best place to find them. So if you find or have found them or any ultra rare item please report it here. Also, I have found that bluejays seem to spawn more often in the forest colony area, and turtles in the fairywood and swamps. I've found a blue ladybug that I ended up losing due to the fact I didn't save, but it was cool nonetheless. I also found a lunar butterfly in swamp area, one of the border tiles, but I can't remember which. Northern Emerald I've seen while swimming around the Island Mine but no way of catching it. Then actually caught one somewhere on the prairie. Catfish I found on the swamp border right next to the Mystic Colony. I haven't tried it too much but maybe playing on very easy makes rare prey show up more. I saw a black Firefly! It was to quick for me to catch it. It spawned in the area under the Mountain domain. It seems like most of the ultra rare items spawn in the swamp areas. Is that a coincidence or is it supposed to happen like that? can you maybe post screenshots of the ultra rare creatures? i'm afraid i'll run past the black dragonfly without noticing hehe. there's a few others I still haven't seen. can't remember where i found the lunar butterfly but I think it was somewhere around the forest colony. I just found a northern emerald in the forest west area and earlier I caught a catfish in the swamplands. I've seen bluejays in Highland Lake and Highland West. I spotted a Lunar Butterfly one time in Forest West. I also spotted two cardinals in the same area.